Where Did 3.4 Million Jobs Go? “In the popular consciousness, startups have never been more celebrated or focused on,” says John Lettieri, founder of the Economic Innovation Group. No doubt. As we mentioned on Friday, Facebook has gone from a dorm-room project 13 years ago to the fifth-most-valuable public company in the world today. Uber, meanwhile, hasn’t gone public… but it’s forever changed how people get from A to B in urban areas, even as it pushes into the realm of driverless cars. But there’s popular consciousness, and there’s the real world in which the number of new businesses — and the jobs that come with them — continues to plummet. We don’t mean to beat a dead horse, having spent so much time on the topic only last Wednesday. But Mr. Lettieri’s organization, the Economic Innovation Group — founded by Silicon Valley heavy-hitters including Sean Parker of Napster fame — is out with its annual report on innovation and startups. 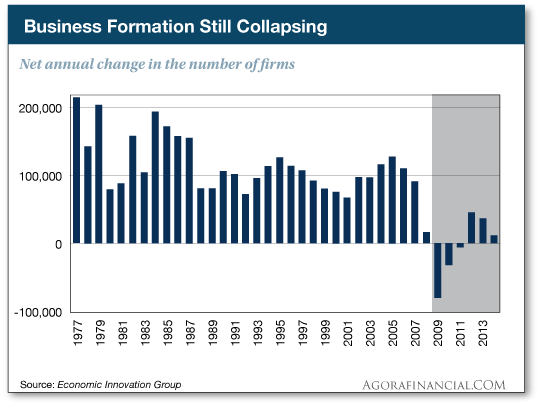 Considering the numbers go only up through 2014, it’s entirely possible we’re now in another period similar to 2009–2011 — when more businesses are going defunct than coming into existence. Worse, the few businesses coming into existence — and the scant new jobs — are concentrated in fewer and fewer places. So much for the idea that the internet would make it possible to work from anywhere. Worse still is the fact that innovation measured by patents is increasingly concentrated in only two industries — information technology and health care. That is, computer-related gear keeps getting better, faster, cheaper. But in the realm of “real stuff,” not so much. “Whether we look at transportation, energy, commodity production, food production, agro-tech, nanotechnology — that with the exception of computers, we’ve had tremendous slowdown,” Thiel said during a 2012 speech we cited here in The 5. As you know if you’ve been reading us for any amount of time, we have zero confidence in politicians to fix anything. Peter Thiel was a major Trump supporter and adviser during the campaign, but he’s had little or no presence around the White House since the inauguration. But rather than wring our hands, we’ll stick to our knitting — steering you toward the most promising investment possibilities in the few pockets of the economy that continue to thrive. Which is a major reason we’re joining forces this year with the one and only James Altucher — hedge fund wizard, venture capital maven, best-selling author and all-around rabble-rouser. James is on a first-name basis with the likes of Peter Thiel and Sean Parker. So he’s got a leg up in identifying tiny, under-the-radar companies that can make a massive difference in the size of your portfolio. We’re now less than 48 hours away from James’ live online webinar revealing what he calls “the 1,000% backdoor secret.” He’ll lay out a strategy to make 10 times your money between now and the end of the year. He’s used a very similar strategy with his own money. The event is Thursday at 1:00 p.m. EDT. We urge you to do everything in your power to clear your schedule and learn about this unique opportunity. It won’t cost you a thing to watch; just RSVP at this link and we’ll make sure you’ll have access. To the markets… where gold is on the verge of breaking out to levels last seen around Election Day. The price started drifting up overnight during the trade in Hong Kong. By midmorning, it appeared to level out around $1,292. You can’t pin this 1% move on dollar weakness; the dollar index is down only modestly as we write, at 96.6. The mainstream is chalking it up to the looming “triple threat” described here yesterday — Comey testimony, the British elections and a European Central Bank meeting, all Thursday. Then again, it might be the rift on the Arabian Peninsula between Saudi Arabia and its tiny neighbor Qatar; after opting to appear neutral yesterday, President Trump is — not surprisingly — now siding with Saudi Arabia. If gold is benefiting from a “safety trade,” so are Treasuries; the yield on a 10-year note is approaching seven-month lows at 2.14%. The major U.S. stock indexes are fractionally in the red. The latest White House pipe dream is for tax reform to get done this fall. So the Senate is supposed to finish writing its totally-separate-from-the-House Obamacare bill, pass it and reconcile it with the House version before the end of next month. Oh, and raise the debt ceiling too. “The last time the Internal Revenue Code was reformed was 1986,” Jim Rickards reminds us. “The time before that was 1954, and the time before that was 1939. That gives you some idea of how rare real tax reform is. (There have been many tax cuts and increases in between, but a full-blown reform of the kind Trump wants falls into the category that happens once every 30 years or so). “But even if all goes well on the tax reform (doubtful), the effective date of any cuts will be Jan. 1, 2018, at the earliest. Which appears to be exactly what a large swath of Corporate America is doing. The tax advisory firm Taxand recently issued a study: More than half of chief financial officers surveyed say they’ve delayed financial decisions because they don’t know what the heck’s going to happen with tax reform. “No one knows what to do. That has huge negative impact on investment decisions, tax decisions and on the economy,” Taxand’s Tim Wach tells Fortune. Back to Jim Rickards: “This delayed income combined with Fed tightening could put the U.S. economy into recession by later this year. “Dave, I’m no expert — but if I understand history, the common confusion about inflation seems to be because many folks equate it with rising prices,” writes one of our regulars — picking up where yesterday’s mailbag left off. “That is one of inflation’s effects, but it takes time to get to this stage. “Inflation is a process. There’s a lag between the supply of money and reaching velocity. “So the Federal Reserve is massively increasing our money supply. Trillions of dollars are now sloshing through the system. Main Street banks aren’t loaning out much of it, except perhaps to corporations — which have been using debt to finance share buybacks and thereby prop up their stock prices. “My favorite part of the game is that the Fed borrows every one of those fiat dollars into existence. The whole central bankster thing is absurd beyond words. “All that money swirls like backwater, ebbing and flowing until something snaps. Meanwhile, asset prices are inflated in the stock and bond markets, while commodity prices are simultaneously deflated. For now, precious metals are still being pushed in both directions. The curious thing, circling back to our main topic today, is how innovation is now concentrated in just two sectors — IT and health care. In IT, prices climb down relentlessly — or at least you can buy more processing power for the same amount of money as time goes by. In health care, a cartel has pushed prices up relentlessly. And in everything else, where progress has stalled, prices are in a slow grind upward. “Apparently, the Chinese are issuing their equivalent of CDOs called WMPs,” a reader writes. “It seems they have ignored the American experience and are digging themselves into a big pit,” the reader goes on. “Apparently, many Chinese investors believe the government will bail out investors if the WMP market goes south. The thinking seems to be the same sort of nonsense that American banks were peddling, that the government was backstopping Fannie Mae and Freddie Mac and, therefore, there was nothing to worry about. The 5: We did. Not even two weeks ago. Are you new here? Welcome to the fold! L) What about mutual funds? No. Mutual funds, and the bank representatives that push them, consistently lie about the fees they are charging. I know this from experience. One time I accompanied a friend of mine who had made some money (she was a model and had a good run for awhile) and was looking to invest it. She asked me to go with her to see her bank representative who had some “ideas.” Because she was beautiful, I went with her to the bank. I didn’t talk at all during the meeting but jotted down every time the bank guy lied. He lied five times. Afterwards I explained each of the lies to her. What happened? She put all her money with the guy. “He’s practically family.” I can’t argue with a good salesman. But he lied about the mutual funds’ performance that he was pitching, the fees they were charging, the commissions he was charging, and a few more I can’t remember now. I wrote an article about it in the Financial Times back then. Fact: Mutual funds don’t outperform the general market so better to invest in the general market without paying the extra layer of fees. Use the criteria I describe above, pick 20 companies and invest. M) What are some good demographic trends? The internet. Yes, it’s still growing. Baby boomers retiring. They need special facilities to live in. They need better cancer diagnostics and treatments. Energy. The more people we have, the more energy we will consume. Go for energy sources that are profitable and don’t need government subsidies. Whenever you depend on the government, you could get in trouble. Temp staffing. Every company is firing people and replacing them with temp staffers. Batteries. If you can figure out how to invest in Lithium, then go for it. I explain easy ways to invest in demographic trends that in ways other people aren’t looking in my Backdoor Investing Checklist. and a dozen others. Feel free to list more in the comments. I plan on covering more in my email newsletter. N) Is a house a good investment? a) Constant extra layers of fees and taxes that never go away (maintenance, property taxes, etc that all rise with inflation). b) Usually housing is too-large a percentage of someone’s portfolio. Even just the down-payment ends up being the largest expense of someone’s life. c) Usually massive debt is involved. If you can avoid, “a,” “b,” and “c” and don’t mind the opportunity cost in the time required to maintain your house then go for it. Else, rent, and use the money you saved for other investments that will be less stressful and pay off more. Fact: Housing has returned 0.2% per year in the past 100 years. O) If no housing and only 30% of my portfolio in stocks, then what should I do with the rest of my money? Why are you in such a rush to put all of your money to work? Relax! Don’t do it! There’s a saying “cash is king” for a reason. I will even say “cash is queen” because on the chessboard the king is just a figurehead and the queen is the most valuable piece. Cash is a beautiful thing to have. You can pay for all of your basic needs with it. You can sleep at night knowing there is cash in the bank. I love a stress-free life. When I look back at the past 15 years, the times when I’ve been most stressed is when I’ve been heavily invested and the times when I’ve been least stressed is when I had cash in the bank. With cash in the bank you can also invest in yourself. You’ll learn about a backdoor method to invest in America’s hottest up-and-coming companies — a strategy that could make you 10 times your money before 2017 is over. It’s Thursday at 1:00 p.m. EDT. Participation is free. (Ordinarily, James charges $525 for an event like this, but he’s part of our team now!) You can sign up at this link.